“Burning Paradise,” opens things with traumatic orchestration before moving into a snarling monster. “Two Sides Of The Story,” grooves and shakes with thunder and the roar of the gods. “Eye Of The Storm,” shakes with thunder and grooves and roars. “Cutthroat Game,” another boiling monster, shaking with ferocity and power. “Cry Wolf,” heavy and downright terrifying in places. “Warmonger,” another song that oozes evil with powerful riffs and snarling backdrops. “Deep Waters,” slows things down and then moves rapidly into hell. 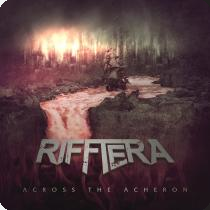 “Across The Acheron,” is heavy and melodic with interesting shifts and turns. The album is out January 18th via Inverse Records.